The incident took place Saturday afternoon in Fairfax County. Virginia State Police spokeswoman Corinne Geller said in a statement Sunday afternoon that the boy landed on a Ford Escape and the impact incapacitated the vehicle's driver. Virginia State Police are investigating the incident as a suicide attempt, CBS affiliate WUSA-TV reports. Geller says the driver of the Ford, 22-year-old Marisa W. Harris of Olney, Maryland, died at the scene. 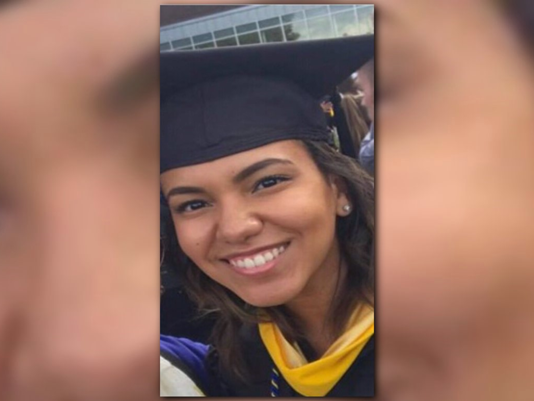 Harris' family said her boyfriend, who was in the passenger's seat, took control of the car and steered it off of the interstate, WUSA-TV reports. WUSA-TV reports that Harris was studying mental health counseling in a graduate program at Marymount University. Harris' mother called the tragedy "ironic," saying the 12-year-old boy who killed her is someone her daughter would have helped.